this is the first house that i’ve lived in where we have a guest bedroom. i’m still working on the design of the room, but for now it’s just very simple. bed, chair, end table and some nice details. preparing for a house guest is one of my favorite things…stocking up at the grocery store with good snacks and flowers, cleaning up the room and preparing for their arrival. here’s a few things i like to do for a guest coming to town to stay…and i’d love to hear what you do, too! clean up: i have two cats and i’d hate to think my guests were living with a bunch of pet hair. i remember when i used to buy a $25 vaccuum online when i was in college and it would break after three times. i got a dyson a while ago and it makes suuuuuch a huge difference. i open the windows in the room to let in some fresh air, put lavender sachets on the pillows, and make sure to do a little extra dusting that day. set up: my mom taught me about being a good hostess. she always went out of her way when someone stayed at our house to make them feel VERY comfortable. i like to set up the room so it feels like they are checking into a hotel. one of my favorite hotels in austin has candles and a water pitcher with cucumber water sitting on a tray on the bed. i took note and try to do the same for my guests. a vase of peonies, a fancy candle, a fresh bath towel and a little chocolate go a LONG way. happy hosting! 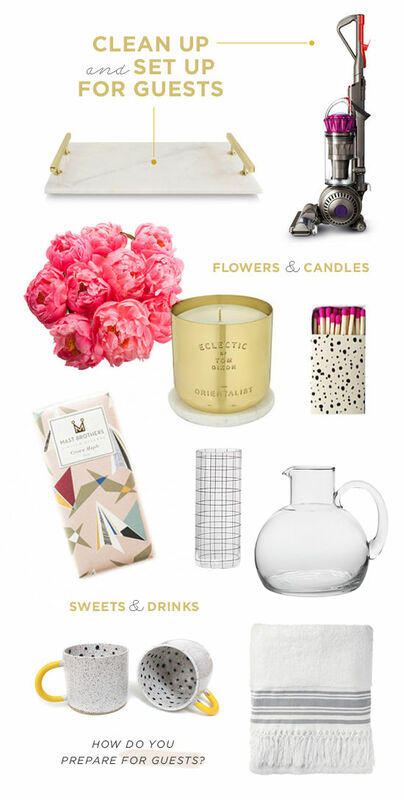 shop these items: dyson DC65 vacuum, high street market marble tray, peonies, tom dixon candle, bellopop matches, mast brothers chocolate bar, kate spade saturday pitcher and drinking glasses, recreation center dot mug, anatolian bath towels. When you say you “got a dyson”… Does that mean you mean you bought one or you were gifted one? This is one of the best sponsored posts I’ve seen. Oh I love the idea of being such a great host someday! I recently saw a bar cart styled for guests with everything from san pellegrino to fresh fruit + flowers! a water pitcher with cucumber water? I die. mary, i was not gifted a dyson for this post. AND that marble tray 🙂 haha! I’m preparing for house guests who are arriving tomorrow and have included similar things on my welcome tray – instead of chocolate & peonies I chose tulips and mini stroopwafels since we’re in Amsterdam!I like to stock up on healthy snacks like little bags of nuts and dried fruit that they can shove in their bags for the day…and it’s also nice to have a few little books about the city & a cycling map on hand. Nice post Bri! I am a big fan of making people feeling at home/being a great hostess. I make and sell my own candles. so I make sure there are at least three going in my house when I have people over, even if it’s just for a dinner. I have our wifi user name and password written down and displayed in a cute frame on the nightstand in our guest room. Great for overnight guests and anyone else who stops by and wants to connect. I have the fondest memories of visiting my Aunt Victoria’s cabin in Wisconsin’s North Woods. She always placed two Andes Candies (instilling an early love of chocolate and mint!) on everyone’s pillows, candles on the night stands and a fresh towel at the foot of the bed. She also has a HUGE selection of travel-sized beauty products in the guest bathroom. I can’t even tell you how many times those have come in handy when I forgot my razor or my shampoo/conditioner got confiscated by the TSA! I love having guests over and treating them like they’re staying at a hotel! I even throw the towels in the dryer for a little bit before they arrive so they have warm towels to use when they come in from a long drive/flight and want to shower. i also hope our guests feel like they are checking into a hotel. i love the water + cucumber water pitcher idea. I also try to have fresh flowers in their room and light some candles in the house before they arrive. Okay, I haven’t had my dream sleep-over yet, but I’m thinking the same way, you do: create an exclusive hotel atmosphere. Fresh flowers and chocolate in the guest room and small bottles of their favourite scented shower gel from Yves Rocher or The Body Shop in the bathroom, that they could even take with themselves if they wanted to. Oh my! Can I be a house guest? This looks wonderful. Iv always wanted to try mast brothers chocolate, but we live in Scotland! I need a new hoover, we have a fluffy cat & I have been using a broom for about 6 months!! Pain in the arse! Our floors are all wood & tile but still. I feel like I should just invest in a Dyson but I think I’m going to get a Numatic Hetty, have you seen them? Pink with a cute face! I can’t resist. I’m not sure why but I didn’t consider our guestroom complete until it had it’s very own folding luggage rack 😉 you know just like the ones they have in hotels! Lol. I guess it may be silly, but it was a personal must.